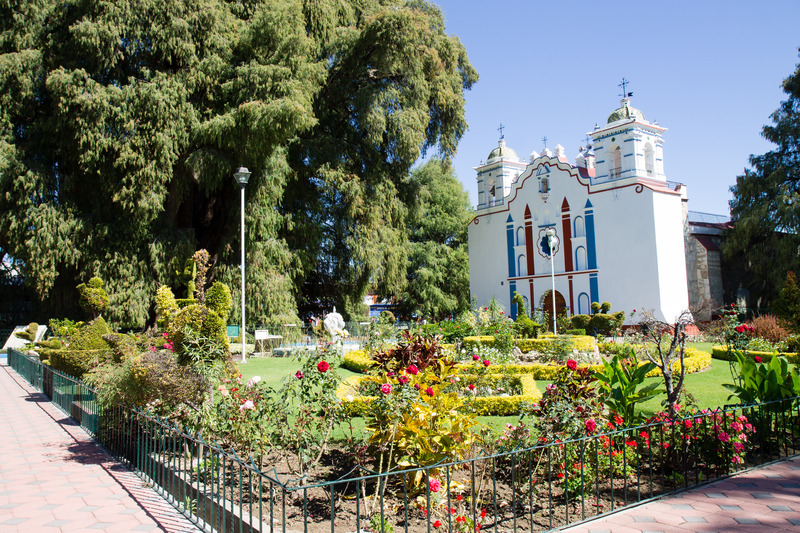 We parked near the town plaza of Santa María del Tule and approached the square. The greenery of an enormous tree towered ahead of us, utterly overshadowing the church beside it. 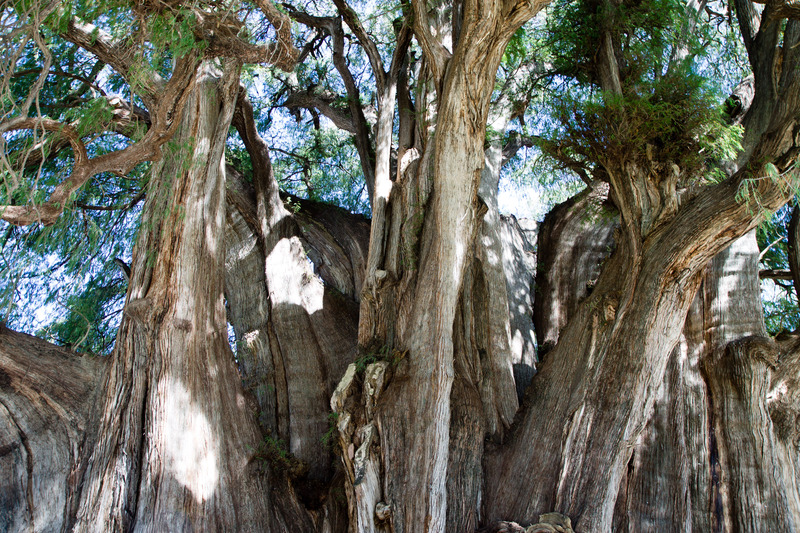 This tree, El Árbol del Tule, is the world’s widest tree and is, at the very least, over 1,000 years old – and some believe it is much older than that. What no one needs to believe, though, because it’s obvious, is that this tree is majestic. After paying the few pesos’ entry into the square, we circled the trunk. It was impossible to capture the its size in our camera frames. So we walked under the outstretched branches and just did our best. 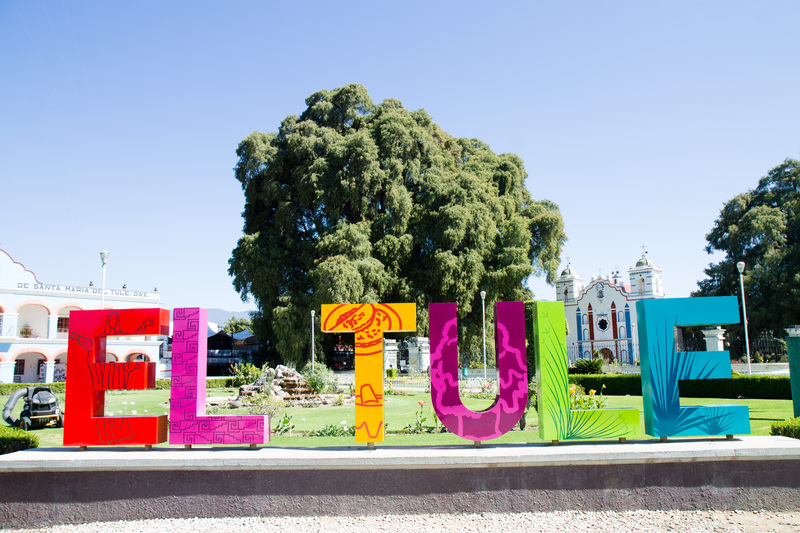 El Árbol del Tule, given its age, has seen not only the arrival of the Spanish to Mexico, but also the arrival of the Aztecs to Oaxaca state. 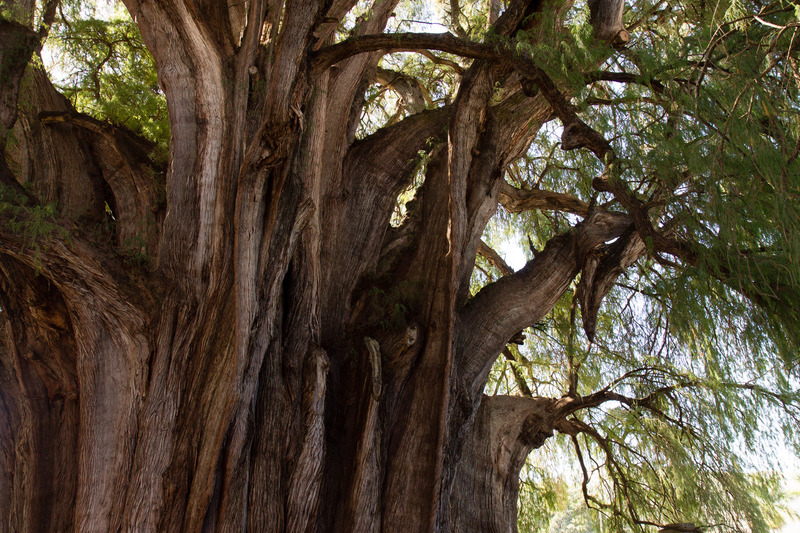 This tree has lived at least a dozen of long human-length lives. Here it stands, surrounded by our artifice. It seems silly, to think this about a tree, but perhaps it shouldn’t be: I hope this tree is happy in a tree way. After all, trees communicate and do all sorts of things the average person just can’t see happening, so I wish this particular tree-comfort and tree-satisfaction. We walked across the street to eat at the neighboring market hall and after doing a round through the building, pushed through with calls of quesadillastamalestlayudastacosmemelas we settled on a stall. I ordered a vegetarian tlayuda (a crunchy, toasty tortilla covered in beans, vegetables, cheese, and meat for the non-vegetarians) and it was far better at this random stall than the one I had the night before at a spot in Oaxaca that was recommended in a guidebook. Ben had a quesadilla with quesillo and squash blossoms. We were more than satisfied. Next up: about an hour-long drive, switchbacks on a sometimes-bumpy road (the newer toll road was closed but we didn’t mind) to Hierve el Agua. 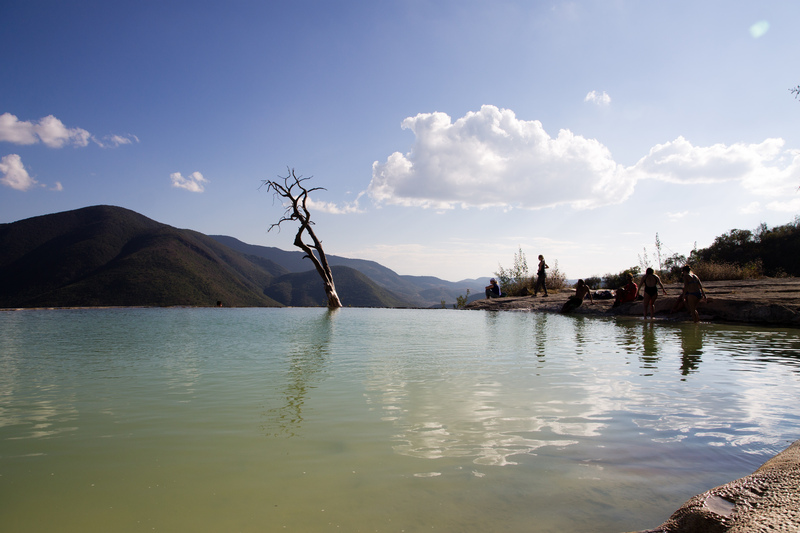 The name means “the water boils” but the water is, in fact, a bit cold – especially the further away from the warmish springs you swim. 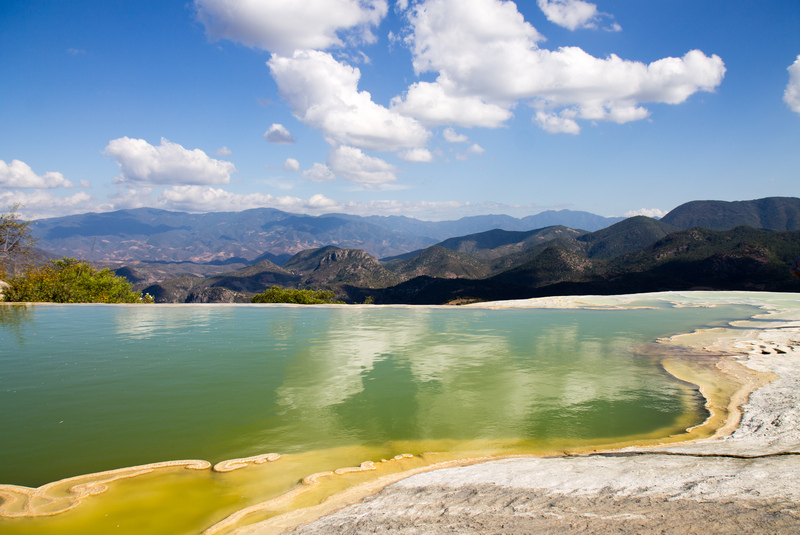 Hierve el Agua is a natural spring area that was modified and used by the Zapotec people for irrigation after they created a series of terraces and canals over a thousand years ago, traces of which remain. 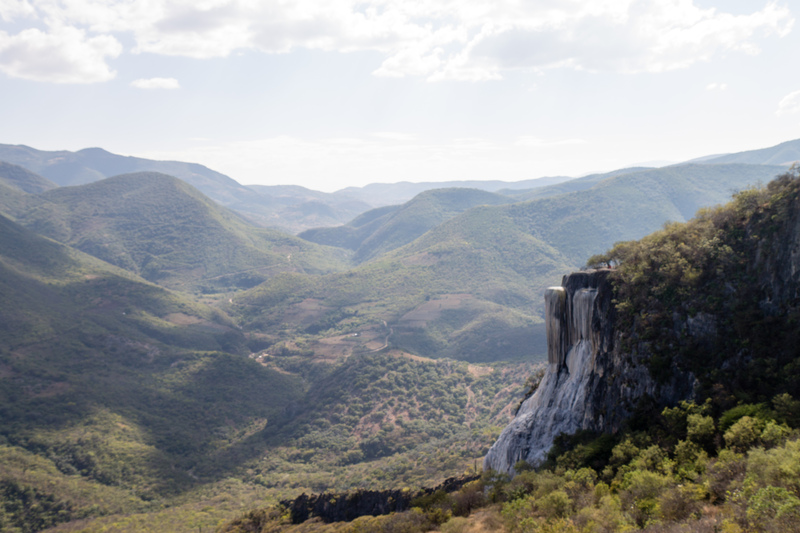 The calcium carbonate in the water has left deposits on two hillsides, creating “waterfalls”, cascada grande and cascada chica, which can be hiked between. 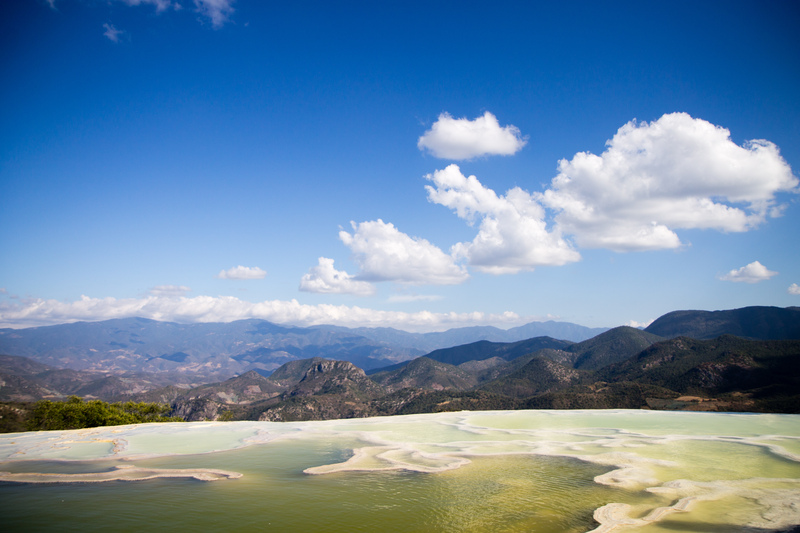 The pools of Hierve el Agua vary in color and in size. I unquestionably had to swim there and despite the chill, I paddled around in perhaps the world’s coolest infinity pool, ringed by slight ridges – the canals – built ages ago. The complex is, of course, a tourist attraction, but not overwhelmingly so. 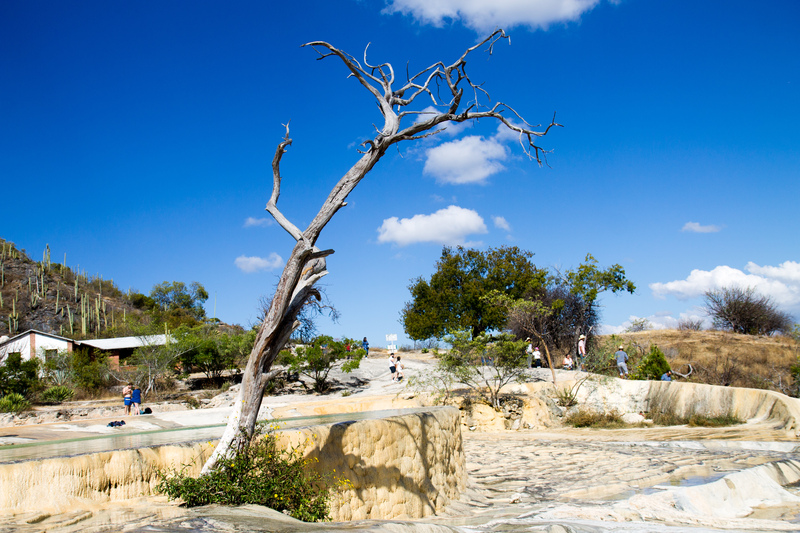 People padded around the pools in their flip-flops and took turns taking photos at the most scenic spots. We wandered around for some time before I changed out of my wet bathing suit and, with a few last photos – it was hard to turn my back on this beautiful spot – walked with Ben toward the parking lot. We stopped at one of the vending stalls along the way and got fruit treats – jicama, pineapple, watermelon, and cucumber sprinkled with chili pepper. 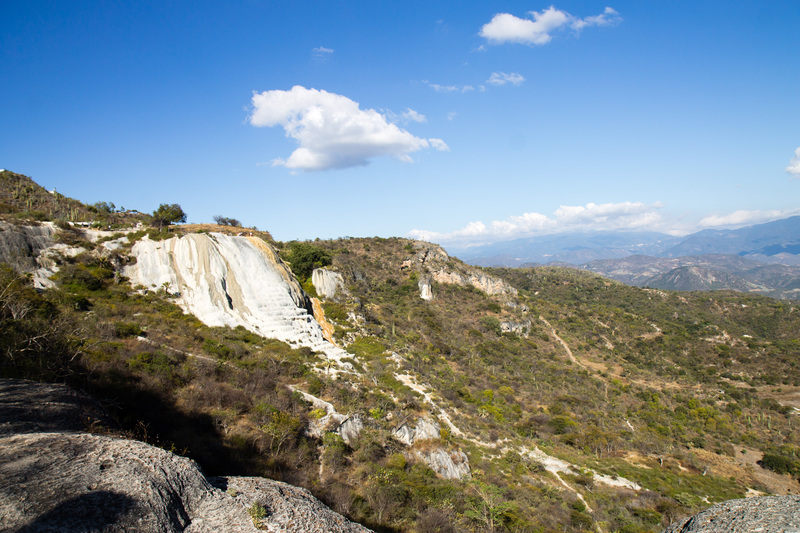 We sat in the parking lot by our rental car, savoring our snacks, before driving down out of the hills back to Oaxaca City. There was more to this one day; this was only the second chapter. The first was visiting Monte Albán. The third was traipsing the nighttime streets of Oaxaca City, popping into mezcalerias and staying at one in particular, spending time chatting with a staff member/mezcalier. The days we elongated there, and the days I wish I could add, are but fractions of drops in the grand bucket of the history of this place, but for me in my one life – they’re outsized. 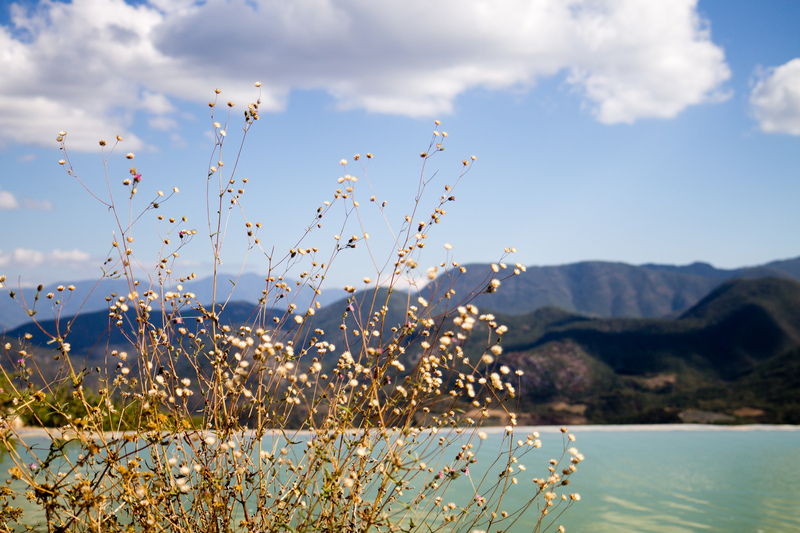 Some of these colour changes – such as that brackish green pond with the darker green hills as background – are astounding! 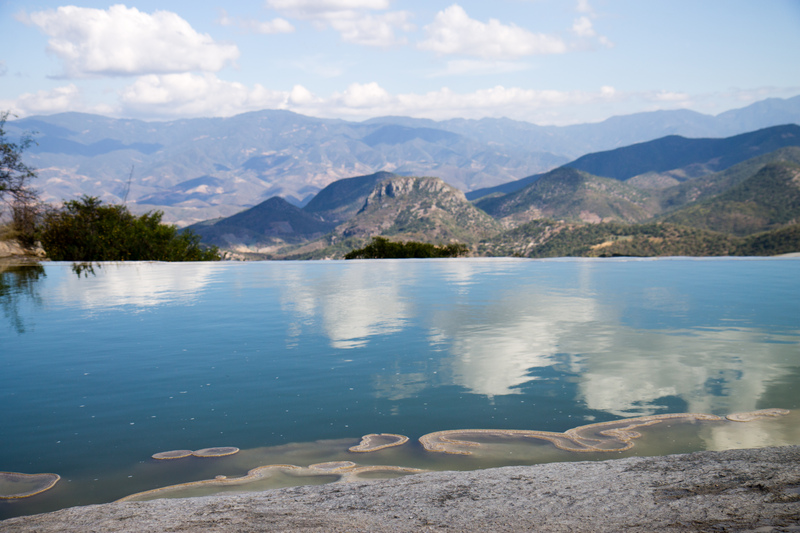 Oaxaca is the part of Mexico I’d most like to see, and your account and images only reinforce this. Those pools are out of this world and that tree. I can just imagine the wisdom contained within. Yes and yes! I hope you can make it to Oaxaca sometime. I wish I had more time there – so much to explore around the state! 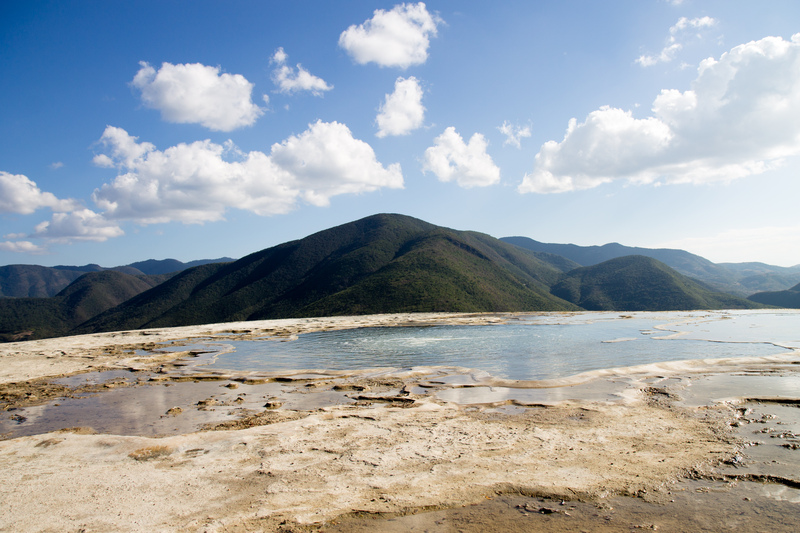 I am really glad we made it outside of Oaxaca City and managed to visit some other places. Unfortunately there are areas where there is conflict. In one of the main squares in Oaxaca City, there is an encampment of displaced people from San Juan Copala, many of them are indigenous Triqui people, from what I have gathered.